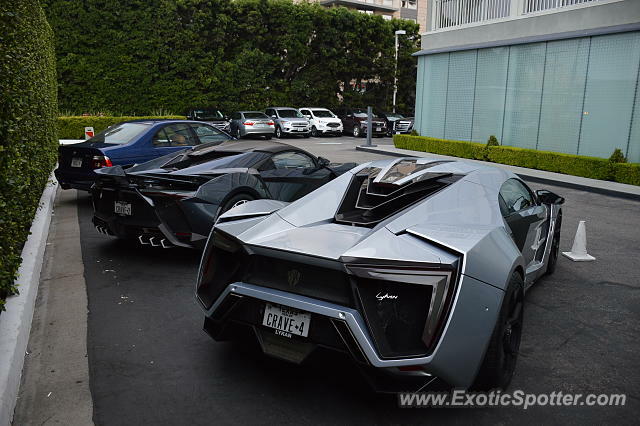 Unbelievable combo of the Lykan Hypersport and Fenyr Supersport toegther at a hotel! Someone told me they were staying here for a whole week but this was my only chance to spot them outside of shows so I got up very early, beat the rush hour traffic, and made it right on time to see these insanely rare Dubai-made cars. Ok why is there always an M5 with these?? I bet one phone call would solve that question. The photo was near a Mecum auction, so maybe it was sold there? However they are located in Texas so it could be a vehicle they just sold, I dunno. I believe the vehicles are not registered to a specific person. Notice the license plates say something ("DEALER" maybe?) under "TEXAS" and both license plates say "CRAVE". I'm just putting two and two together and assuming they belong to Crave Luxury Auto based out of the Woodlands, north of Houston. Crave has sold many very high end vehicles over the years, so these come at no surprise to me. Hahahaha, I'm not surprised that the vehicles are registered in Texas. Oil money baby! @Bonehead I see...would love to go! If you go to Monterey during the Mecum Auto auction, you're bound to find some rare cars. Nothing against King_AM, but this isn't luck or dedication. Regardless, very cool cars. A Lykan Hypersport and a Fenyr?